DESCRIPTION: This is only one part of a group we were able to purchase a while back in Germany. It was a very vast set with hundreds of pieces and we were one of three dealers who managed to get in on the offering. We will soon add to this lot some plates and dishes and a demitasse coffee set, but for now we offer the crème de la crème of the groupings and that is the tea-for-two set. 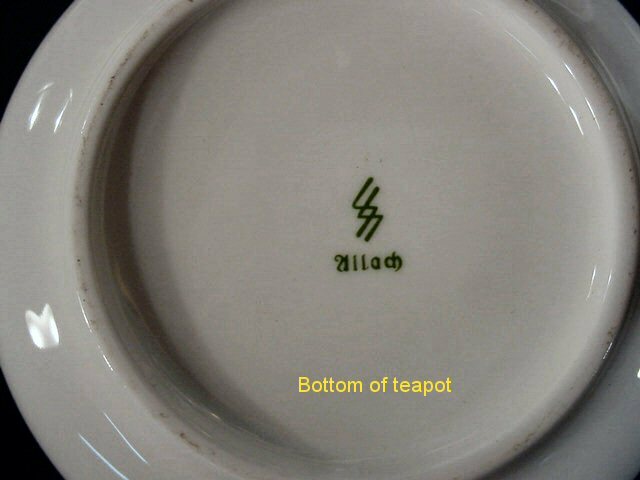 This china was, of course, made for Hitler by the SS Allach firm in Allach Bavaria near Dachau. The set was found in the deserted Allach Factory in unopened boxes. 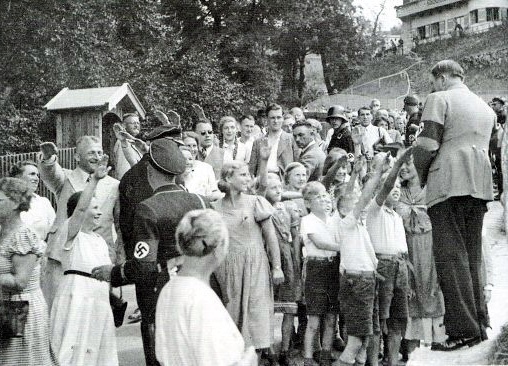 That they were meant for delivery to Adolf Hitler is certain, and their condition is absolutely mint. They are some of the most regal porcelain dinner pieces ever encountered and are not only beautiful, but very historically important, as well. 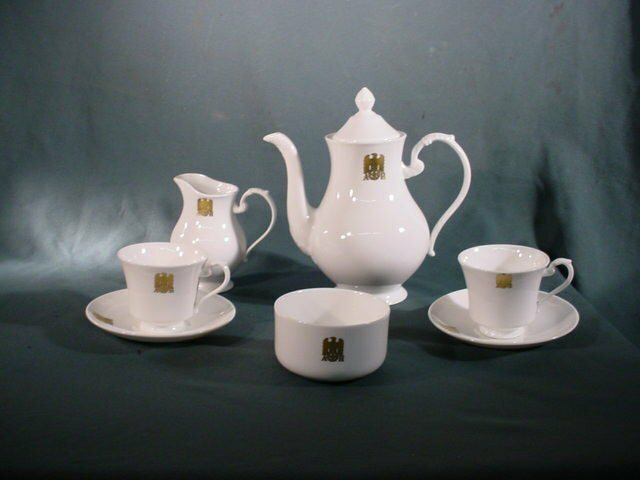 The set consist of a teapot, sugar bowl, creamer, two cups, and two saucers. This is extremely rare and is prodigiously historically important. 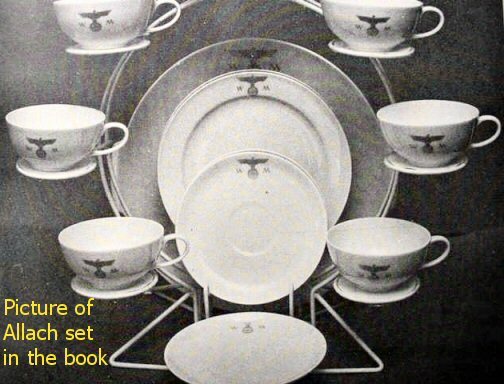 We sincerely believe this set was destined for the Berghof, Adolf Hitler's mountain retreat in the Obersalzberg high over Bertesgaden in the German Alps . Possibly they might have been intended for the Bertesgaden Reichschancellery nearby, as well. For more information on the Obersalzberg home refer to item AH 7-1, an incredible original album . Also visit item Art 5-6, for a view of the Bertesgaden Reichschancellery. 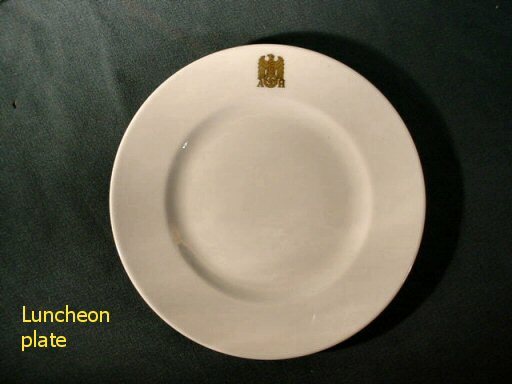 This set of porcelain pieces must be at least one of the most historically important Hitler pieces ever made available. 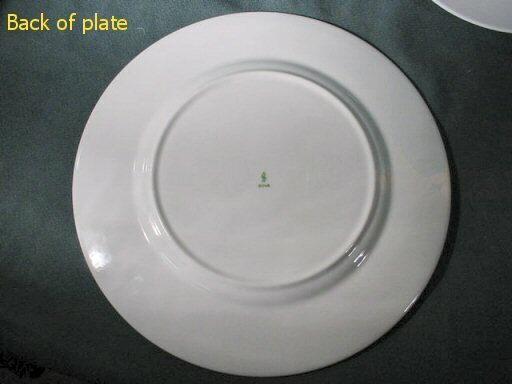 DESCRIPTION: Here is, in addition to the tea set above, a dinner plate and luncheon plate, part of the collection that was bought a few years ago. 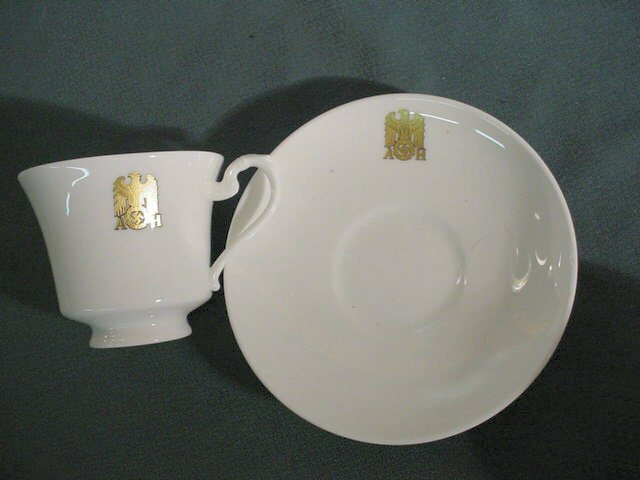 The items were made by the Allach Firm that was owned and operated by the SS under the direction of Professor Obersturmführer Carl Diebitsch, Theodor Karner, Franz Nagy, Richard Forster, and other porcelain artists extraordinaire. The extraordinary figures, plates, plaques, candle holders made n the stark white or vibrant color is unmatched by any other company including Roesenthall, Meissen, Nymphenburg, etc. 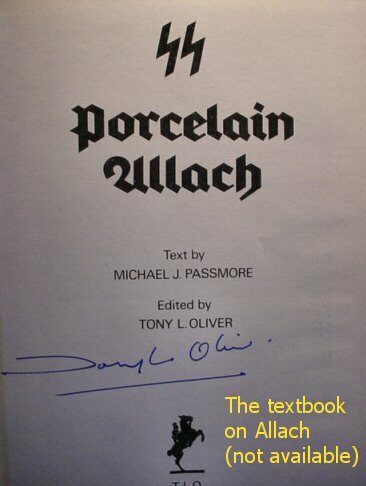 The Allach Porcelain Firm was created by Prof. Diebitsch in 1936, at the behest of Reichsführer Heinrich Himmler. 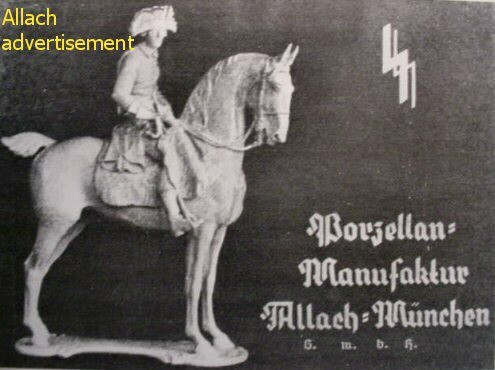 As a result of being NS-government sponsored, the finest artists of the craft came from the other aforementioned companies and the Allach Porzellan Manufaktur had some of the finest facilities in the entire world of porcelain art. The quality of the pieces is extraordinary to the extreme. 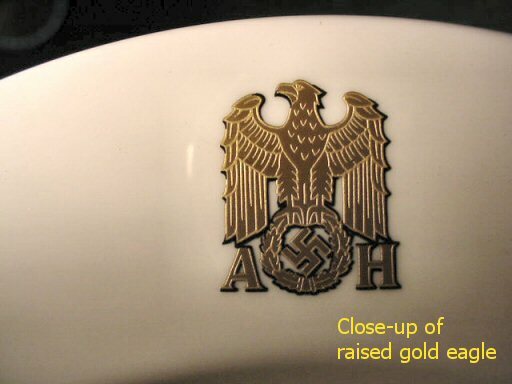 You can see this reflected in these plates and dishes even if only a Reich’s eagle in gold overlay is evident, but what an eagle! 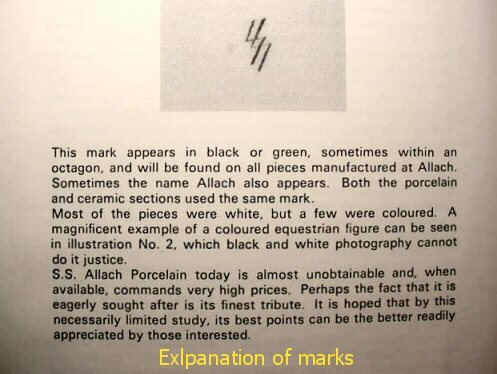 Allach porcelain was not directed toward profit. 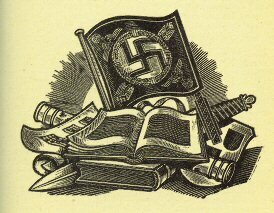 Rather, the products of the factory were intended to support education to National Socialist-motivated people of the Reich. 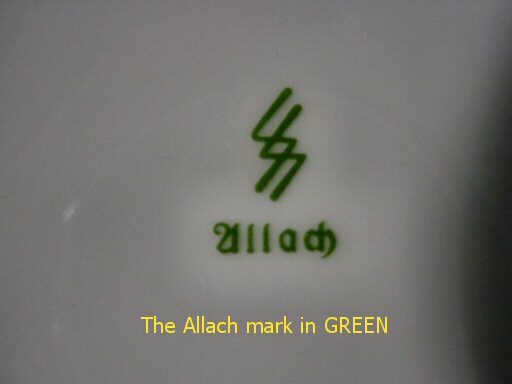 Originally, the Allach factory produced only art ceramics such as plates, jugs, and vases, but in the war years, it manufactured special gift items intended for loyal SS supporters that were often given at high-dinner parties and gala SS occasions. 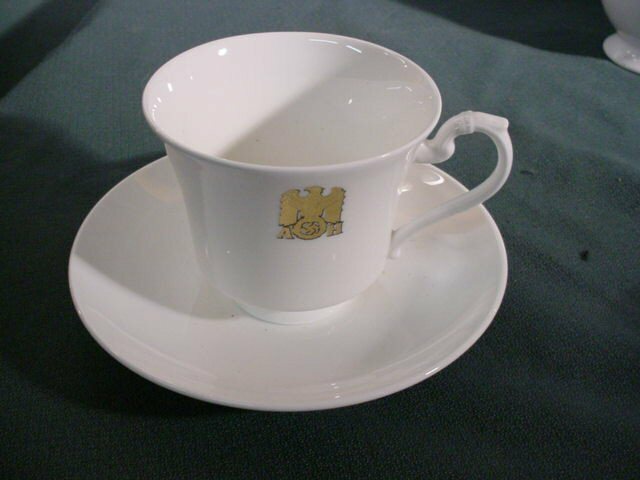 Very special items were produced for presentation to the highest NS German leaders. 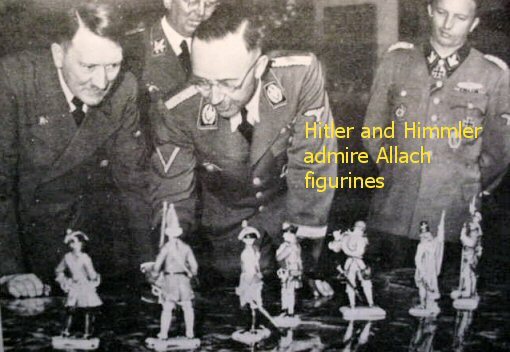 This brings us to these Allach Adolf Hitler porcelain pieces. We know that a one-of-a-kind desk set to include an inkwell and desk roller blotter holder was produced for the Führer, with a vibrant gold NS eagle and a facsimile of his signature. 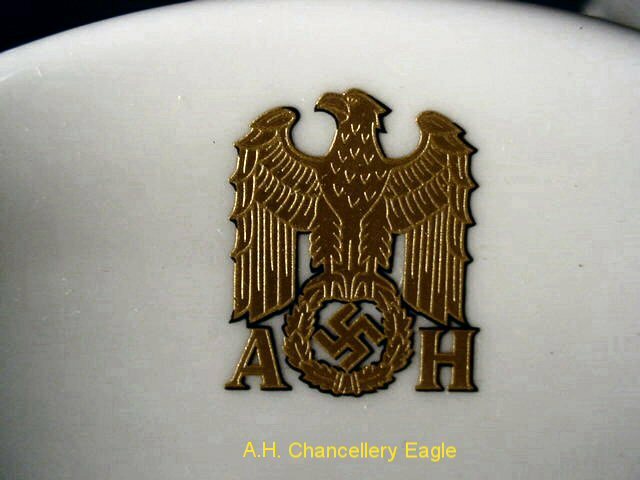 Also, a great large vase was presented to him again with the Reichs Chancellery eagle similar to the one on these plates, only much larger. The set, as far as we have been able to research, was made for a birthday present for Adolf Hitler to be presented to him at his Obersalzburg mountain retreat over the Bavarian town of Bertesgaden and possibly for the Bertesgaden Reichs Chancellery that was located in the center of what was sleepy, but beautiful Bavarian village. For more information on this second Reichs Chancellery, go to item Art 5-6. We were not the only dealer who was able to buy into this grouping when found. Another dealer in King of Prussia, Pennsylvania, and a malevolent scalawag in Bowie, Maryland, also managed to acquire quite a few pieces. 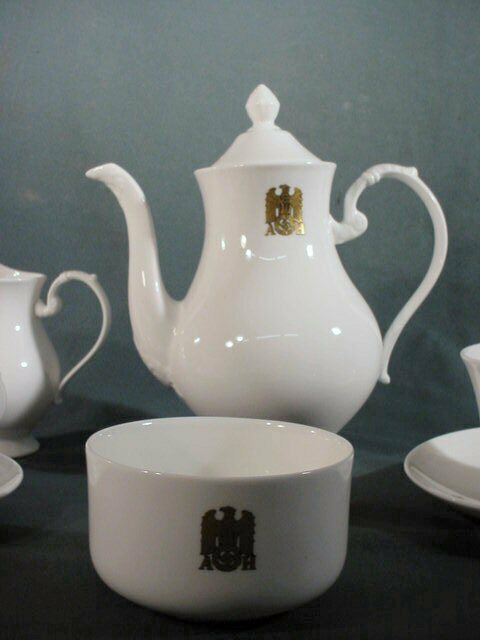 Germania, however, tries to make the items affordable, not like the Maryland dealer, who raises the prices of the Allach porcelain to the sky limit. The pieces are both beautiful and historically important, but a very large grouping was found (the whole service for 50 or more banquet guests). At this point, however, most of it has been sold and a few of the better (laid back) pieces are still available. 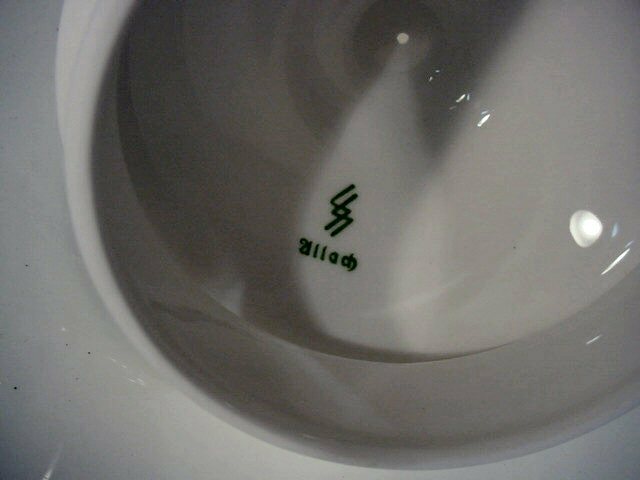 This is your chance to own a true Adolf Hitler article, and at the same time acquire a great piece of fine porcelain by Allach. 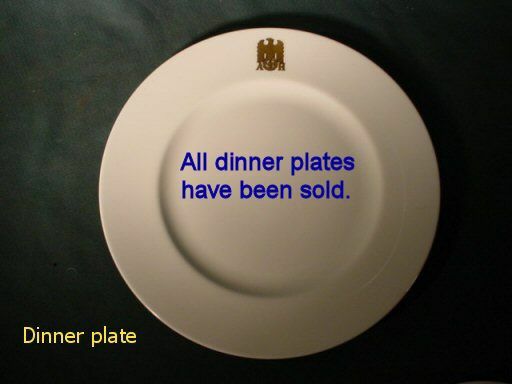 PRICE: Dinner plate; we no longer have dinner plates; all SOLD; Luncheon plates; We still have TWO priced at $1,500.00 each.